If you've never used a looper before, this is a great place to start. Ease of use. Versatile range of effects. Reasonably priced. No loop storage or transfer facility. Having made its first foray into the world of looping pedals last year with the VDL-1 Dynamic Looper, Vox has now brought out a more affordable and more compact looper pedal, the appropriately named Lil' Looper. Like the VDL-1, the latest pedal offers two independent loops at once, with a combined loop length of up to 90 seconds, and has a full complement of effects that can be recorded into a loop, but is missing the VDL-1's treadle and onboard memory programs. "Loops can be recorded freeform or you can use the metronome and/or the associated loop quantize function for timing help"
The Lil' Looper can be used as a standard guitar pedal but adds versatility in that it can also take mic signals and has a headphone output if you want to noodle away in silence or listen to the handy onboard metronome through a pair of headphones while sending the guitar sound to an amp. It can also run off battery power so you can use it anywhere you want. The set-up is designed to provide a footswitch for each loop with easy operation - one press for record, play and overdub, two presses to stop, and hold to undo the last action. Loops can be recorded freeform or you can use the metronome and/or the associated loop quantize function for timing help - with loop quantization it's easy to create phrases that will automatically loop on the beat, and the feature also allows you to synchronise loop one and loop two to the same tempo. The tempo is set via a tap tempo button, and you can turn the metronome volume to zero and just use the flashing button as a visual cue. Another useful feature is auto recording, in which a loop starts recording as soon as you start playing. To make your loops more interesting there's an array of effects that can be recorded into the loop. These are grouped into three categories - pedal, modulation and simulation - each called up with a press of a central button, which lights up red, green or orange. Once you have chosen the category, you can dial up one of the four effects within it using a rotary knob divided into four quadrants - moving the knob clockwise in any effect's quadrant increases the value of a crucial parameter until you reach the start of the next effect. The pedal effects are a compressor and three different types of dirt (crunch, overdrive, distortion). For modulation, there's a choice of chorus, phaser, stutter (on/off tremolo) and delay, while the simulation effects offer an acoustic and bass guitar simulations, radio-style EQ and pitch shifting. The single-knob set-up is simple enough to quickly get the hang of, although you need to be quite precise with some of the effects - the pitch parameter changes in semitones, while the delay offers increasing delay times. Each effect also has a second parameter, which can be adjusted by holding down the effect button and turning the value knob. 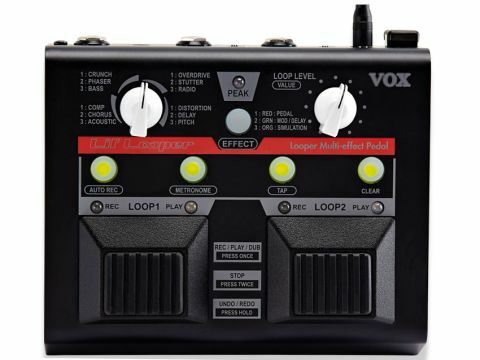 "The Vox approach to looping pedals is different from its main rivals in providing no storage or transfer facility for loops, the emphasis being on live performance"
The Vox approach to looping pedals is different from its main rivals in providing no storage or transfer facility for loops, the emphasis being on live performance. It's more about the moment and spontaneity. And plugging into the Lil' Looper will certainly let you get creative, layering up your recordings as you're playing on one loop inspires the next loop or overdub. The effects have been nicely chosen too, so you can have a range of tones in your mix - clean chorused chords perhaps, with a distorted lead, simulated bass and some harmonised guitar courtesy of the pitch shifter, which has ranges from a octave up to an octave down. The whole process is pretty easy to operate using the twin pedals, but if you want a bit more control, there's provision for adding an extra footswitch, which will let you turn the effect on and off, select the effect type, stop the operation of each loop separately or delete individual phrases. The Lil' Looper is a neat little piece of gear and good value considering that it can also double as an effects pedal when you don't want to use the looping facility - adding the extra footswitch allows practical effect switching. Absorbing and fun, as well as being a valid practice tool, it's a great introduction to looping for the uninitiated.